Non-invasive ventilation (NIV) is the delivery of ventilation support using techniques that do not require an invasive endotracheal airway. NIV achieves comparative physiological benefits to conventional mechanical ventilation by reducing the work of breathing and improving gas exchange. The intervention is recognised as an effective treatment for respiratory failure in chronic obstructive pulmonary disease, cardiogenic pulmonary oedema and other respiratory conditions without complications such as respiratory muscle weakness, upper airway trauma, ventilator-associated pneumonia, and sinusitis. Type II respiratory failure. Consider CPAP for type I respiratory failure. Increased work of breath causing ventilatory failure for example increased CO2 on an arterial blood gas, fatigue or neuromuscular disorders. Not often used with infants, nasal CPAP is more commonly used. Do not set up NIV unless you are familar with the equipment, circuits, masks, etc.and are confident as to how safely to establish the patient on NIV and appropriately respond to blood gas results. The decision to use NIV and the settings chosen must always be made with the medial and nursing team looking after the patient. Introduce the treatment to the patient slowly. Patient needs to keep mouth closed if using nasal mask. Some patients are less suited to NIV; however, each situation should be individually assessed. NIV should generally be used in ICU/HDU environments - make sure you are aware of your local policy. Introduce the patient slowly to the equipment and all its parts. Ensure the mask fits comfortably and that the patient can experience the mask on their face without the ventilator. Allow the patient the opportunity to feel the operation of the machine through the mask on their hands or cheek before applying it over their nose or mouth. 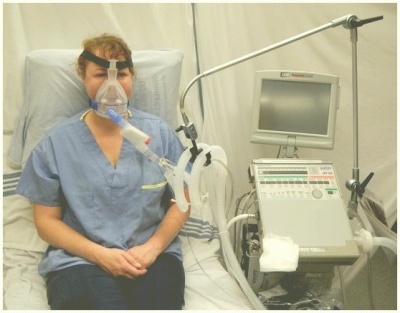 Allow the patient the opportunity to practice breathing with the ventilator, either by holding the mask in place or allowing them to hold it in place. Adjust the settings initially for comfort and establish whether the patient can relax comfortably in a sleeping position. Provide opportunities for the patient to feed back any discomfort. Assess and adjust the performance of the ventilator during an afternoon nap to optimise gas exchange and comfort. Progress to an overnight study, continuing to monitor and optimise gas exchange and sleep quality. Pressure ulcers associated with the use of NIV is a growing clinical problem due to the increased popularity of the intervention. 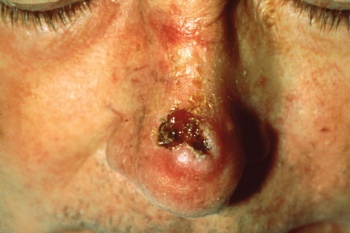 Prevalence of grade I pressure ulcers have been estimated at 5-50% after a couple of hours and 100% after 48 hours. The development of pressure ulcers is associated with poor clinical outcomes, increased complications, and length of hospital stay that compound with the consequences of acute illness. Medical devices such as NIVmasks have unique risk factors including: the existence of a microclimate individual to the device, the method in which the device is secured, that devices may obscure the skin, and that the areas at risk are not routinely checked. Clinicians’ primary focus has been to attain a mask seal, as air leaks are associated with reduced tolerance to the intervention. The alternating airflow from bi-level positive pressure means that a seal is important to avoid ventilator asynchrony. Therefore strap tension is increased, with the risk of pressure damage a secondary consideration. It is important to consider that the patient may not be able to respond to an uncomfortable mask fit or excessive load delivered to vulnerable areas of skin due to sedation, medication, or neurological disease or injury. Furthermore, the patient may be too weak to reposition the device. Oronasal masks have traditionally been preferred for their comfort and ease of use however other interfaces have been recommended as superior. Prophylactic interventions should also be considered. ↑ 1.0 1.1 Nava S, Hill N. Non-invasive ventilation in acute respiratory failure. Lancet 2009; 374(9685): 250-9. ↑ Vitacca M, Ambrosino N, Clini E, et al. Physiological Response to Pressure Support Ventilation Delivered before and after Extubation in Patients Not Capable of Totally Spontaneous Autonomous Breathing. American Journal of Respiratory and Critical Care Medicine 2001; 164: 638-41. ↑ Pingleton SK. Complications of acute respiratory failure. Am Rev Respir Dis 1988; 137(6): 1463-93. ↑ 4.0 4.1 4.2 4.3 4.4 4.5 Harden, B. (2004). Emergency physiotherapy: An on-call survival guide. Edinburgh: Churchill Livingstone, pp.253-254. ↑ Carron M, Freo U, BaHammam AS, et al. Complications of non-invasive ventilation techniques: a comprehensive qualitative review of randomized trials. Br J Anaesth 2013; 110(6): 896-914. ↑ Black JM, Cuddigan JE, Walko MA, Didier LA, Lander MJ, Kelpe MR. Medical device related pressure ulcers in hospitalized patients. Int Wound J 2010; 7(5): 358-65. ↑ Dellweg D, Hochrainer D, Klauke M, Kerl J, Eiger G, Kohler D. Determinants of skin contact pressure formation during non-invasive ventilation. J Biomech 2010; 43(4): 652-7. ↑ Yamaguti WP, Moderno EV, Yamashita SY, et al. Treatment-related risk factors for development of skin breakdown in subjects with acute respiratory failure undergoing noninvasive ventilation or CPAP. Respir Care 2014; 59(10): 1530-6. ↑ Vaschetto R, De Jong A, Conseil M, et al. Comparative evaluation of three interfaces for non-invasive ventilation: a randomized cross-over design physiologic study on healthy volunteers. Crit Care 2014; 18(1): R2. ↑ Weng MH. The effect of protective treatment in reducing pressure ulcers for non-invasive ventilation patients. Intensive Crit Care Nurs 2008; 24(5): 295-9.